....is pretty much my motto. Anything can happen at any given time. The recent stage collapse in Indiana got me thinking. 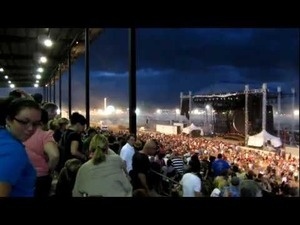 For those of you who haven't seen this, the Indiana State Fair had a stage set up for a concert. You know the type, a self-contained stage with box truss above for lights etc., and just before the concert a storm blew up and an estimated 70 mph gust brought it down. Five people died. After I saw this, I was talking to a rigging key friend of mine and asked him about what could have been done. "No one would have budgeted for a seventy mile an hour wind," he said. At the least, they should have just evacuated everyone when it started looking rough. Danger is all around you any time you rig something. Anything can happen. Years ago, I was doing "B" camera on a feature that involved a lot of eighteen wheel trucks roaring down a highway. It was basically Smokey and the Bandit with more gunfire and less humor. And the trucker was smuggling guns instead of Coors. We had several specialty rigs for shooting and one of them was a top drive truck with a platform off the front and a crane mounted on the platform. A top drive truck is a truck with the actual steering and control of the vehicle done from the top of the cab by a stuntman while the actor sits in the cab and pretends to steer. The "A" dolly grip and I had strapped and harnessed ourselves to the front of this monstrosity, prepared to swing the crane arm around getting shots of wheels, driver, etc as we roared down the road. This was unsetting to say the least. I asked the other dolly grip what he was going to do if something went wrong. He smiled and pulled out a huge buck knife and stuck it in his teeth. This did not make me feel better as the truck pulled out onto the road and I could feel the engine sucking my shirt into the grill. I made my own knife handy and hoped for the best. Luckily, when the hydraulics for the steering on top of the cab went out, we were already pulling over to reload after several takes of the wheels hurtling down the road. It could have been bad. Just one of those things you wouldn't think about happening, but did. This also came to my mind a while later when an aquaintance of mine, a police officer, was talking to another police officer friend of mine and I heard him say, "D doesnt know what it's like. He doesn't face danger every day." The fact is, that we do. And anything can happen at any time. So when you're doing that overhead shot with a camera shooting directly down onto an actor's face, and you've got a minute, throw a stand under the dolly arm. Or when the thought comes into your head that maybe you should double check the tightness of a knob on the crane arm, or a connection on the levelling arm, do it. You don't have to be paranoid, just go the extra step. Anything can happen and you could save someone's life. In the twenty five - plus years of my film career, I've only ever quit a job once. It was on a crappy MOW where we where shooting in a train maintenance building. I was crane operating for the first week. The DP and director were "boyz clubbing" and just screaming to turn over. At which point all three camera crews would look at each other wondering what we were doing. The director would send locomotives through the building at 50 miles an hour, wanting to have the camera start below track level and boom up to have the train pass underneath. Too many times with close calls where I could have been killed had me packing and off to the next show.